Ken set up the video camera to catch the sunrise on Saturday. Usually I'm up in time to see Venus rise and make a cup of coffee before the sun comes up. This Saturday, for some reason, I stayed asleep. I do sleep better out here. Perhaps it's the penetrating silence and the solitude. I love this video, but wish I could slow it down a bit. A city slicker drives through the countryside and witnesses an unusual sight. He stops. A country bumpkin is holding a pig up to an apple tree so the pig can eat the apples. The slicker says to the bumpkin, "Think of all the time that would be saved if you shook the tree and let the pig eat the apples off the ground." The bumpkin replies, "What's time to a pig?" Living among thousands-of-years-old Larrea trees(creosote) while planting whisper thin 8" desert trees gives time an unreal quality, and isn't that a more appropriate way to view time? As unreal? For instance, would we even need time if we didn't have money? While time is traditionally measured against distance, in our day-to-day lives it's measured against money. How much money do you need to live each month? How many kilowatt hours are you charged? How much are you paid in an hour or a month? And does not this time/dollar continuum prevent us from experiencing many things? I'm convinced that ghosts are those who have managed to seep through the chinks in our construct of time. Consider this verse in the book of Hebrews in the Bible. How differently would we treat the land and our world if time eroded and we felt we shared space with a great cloud of witnesses, with the elders who so carefully tended the places we live? if we looked for their approval of our actions instead of looking to the man pays us by the hour or month? Would we not more easily see that we ourselves are colonized, as they eventually were, every waking moment of every single day? Southern Pimas living in a brushwood enclosure. "The first thing the missionaries in the early times had to do was to force the Indians to leave their scattered ranches and form a pueblo. To make a place a pueblo they had to build a church. The Indians were pressed into service to erect the building, and kept at work, if necessary, by a troop of soldiers who often accompanied the missionaries and in this way assisted them in spreading the gospel." 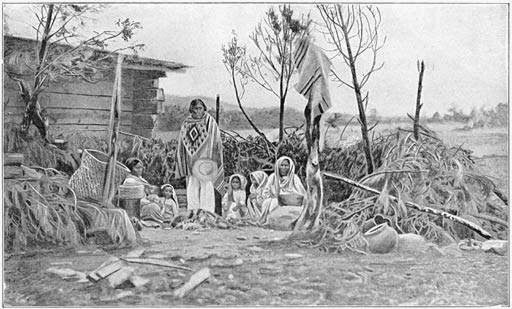 Indigenous peoples were forced off their land where they were relatively self-sufficient and made into consumers who traded time for money so they could buy what they needed. It took soldiers and missionaries and the church with its bells ringing the hours and its alternating threats and promises to beat into people the equation "Time is Money," when they had little need for either. Whenever I sometimes venture to Ken, when I sometimes unconvincingly plead that another world is possible, he reminds me that another world is here, in the shell of the old. We just need to see it and expand it. The desert and my partner - great teachers.